When it comes to the purchase of bedroom sets, there is no single standard size or design to symbolize the ultimate comfort and the fanciest design. There are several sizes available in the market ranging from single, twin, queen, to the standard/eastern king and California king sizes. However, amongst all these different types of bed sets, the most appreciated and relatively affordable one is the queen bedroom set. 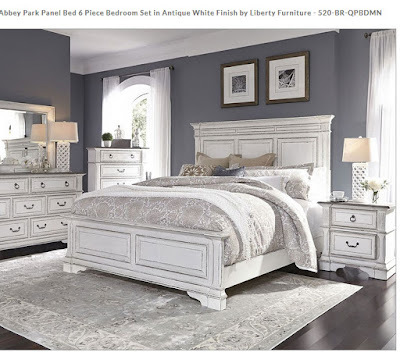 Prior to purchasing a queen bedroom set, it is essential for customers to know about the design and material of different types of queen sets available in the market. In order to make you aware of all the subsequent information regarding queen bedroom set, here, we present you a comprehensive customers' guide. Queen bedroom sets are widely touted as the most economical yet sleek and classy furniture in this particular segment. Primarily, the set comprises of three entities- an optimal sized cozy bed, a nightstand, and a dresser. However, some sets have some additional elements too, which include a mirror or an armoire, a second nightstand, bench, and a complementary set of drawers, etc. It is up to you to buy a regular three-piece set or a luxurious five-piece one, considering the available space and the need for additional storage areas. The material of construction for a bedroom set depends on its design and quality, but for the most part, queen beds and their relative components are made up of high-grade wood such as walnut, birch, oak, etc. And, almost every single bedroom set is finished with a final touch of stain. The next important factor that needs to be considered is the design style of the bedroom set. Before visiting the furniture store, customers should have a clear idea of what they want- a sophisticated, elegant set, or a modern, funky one? The choice depends largely on the age and interest of those for whom the set is being bought. There are two popular types of shapes available for queen sized beds. The first has smooth and straight lines, while the second incorporates interacted curves. The buyer has to select interiors according to the architecture of the room and the respective color(s) of the walls. Inclusion or exclusion of headboards and/or footboard to a bed makes it different from the rest. Although the addition of footboard serves aesthetic purposes only, headboards on the other hand, are sometimes deigned in a manner to serve as storage shelves too. Furthermore, another feature that results in different types of queen beds is the presence of a canopy. Many sets have this unique design, with each wooden corner of the bed extended high above the mattress to serve as a canopy. If you are looking for an affordable store that provides durable queen bedroom sets, please visit Home Cinema Center at http://www.homecinemacenter.com to discover some amazing designs and deals.